Some eight kilometres East-Northeast of Delmas (South Africa), the Weltevreden pan is home to a myriad of water birds. But today, neither birds nor farmers who use the groundwater from the wetland have reasons to be ‘satisfied’ – a translation of ‘Weltevreden’. They were taken by surprise when one day the mining firm Exxaro, which legally operates Leeuwpan Colliery, about six kilometers away, started to dig trenches in Weltevreden pan – without permission to do so. When the saga unfolded, it grew from an illegal mining operation in one wetland to the rule of law in South Africa and the arrogance of a big company saying that people just had to trust them on their word. The Mpumalanga Highveld area is known for its abundance of important wetlands, for highly productive agricultural land … and for coal. Coal reserves are particularly dense in the areas where pans are located. According to Mr Peet Bezuidenhoud, a commercial farmer in the area, retrenched farmworkers seldom receive an opportunity to share in the wealth created by mining because they do not possess the required skills for employment in a mining environment. And opencast mining activities always result in environmental degradation on the short and long term. Apart from the waterbirds, local farmers also rely on the pan’s positive contribution to the water table to provide moisture to their mostly dry-land (non-irrigated) maize fields. 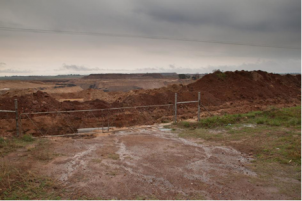 Opencast mining has been expanding in the area since 1993 but at the end of 2011 commercial farmers noticed that a mining company had dug a trench around the previously unspoilt Weltevreden pan, preventing water from entering the pan. This is the standard strategy to lay dry an area prior to any mining activities. The farming community was the first to identify Exxaro as the company responsible for the operation and objected to the activities. Exxaro initially denied any illegal activities on their part. After failed attempts to discuss the matter with the mine manager, members of the farming community laid a complaint with the Department of Water Affairs (DWA) and informed the media. The DWA conducted various investigations, issued directives and eventually another directive commonly understood by observers to be a stop order on June 12, 2012. Eight days later they visited the site, confirming that Exxaro has removed its equipment from the area as per the order. The matter was also raised in the National Assembly, where the Minister of Water Affairs confirmed that Exxaro stopped mining the pan. Exxaro confirmed this in a meeting with the DWA on the following day. But the case was discussed again at the National Assembly in September. Suddenly, Exxaro claimed that they did have permission to mine, without providing any evidence supporting their statement. There is no mention of Weltevreden Farm in the public documentation presented on the website of Exxaro, except for a brief mention under the Leeuwpan Mine. Exxaro does hold a license to mine Leeuwpan, but that is six kilometres from Weltevreden pan and leads to confusion in the media. Exxaro may have compromised its own values by capitalising on the confusion when they released a press statement in October in response to a newspaper report about Weltevreden Pan but referring to the Leeuwpan operations, stating that “Leeuwpan complies with mining, water use and environmental legislation.” While this may be theoretically correct regards the Leeuwpan operation, this statement is perceived to be a deliberate deceptive act, moving the focus from the pan currently under threat to a wetland that was somehow legally destroyed by Exxaro’s operations. Exxaro also submitted the first two pages of the approved water license. This licence refers to Leeuwpan only. It states that Exxaro may take water, store it, impede or divert its flow, pollute it, and alter the bed, banks, course or characteristics of a watercourse at Leeuwpan. The license does impose conditions. Exxaro declined an opportunity to supply the geographical borders of the license and the full license with the conditions included. After a request for information, various follow-ups and incomplete responses Mr Hilton Atkinson, External Stakeholder Relations Manager of Exxaro Limited responded by saying: “Exxaro will not be stating categorically that it is authorised to undertake operations at its Leeuwpan mine if it does not believe that it is legally compliant to do so.” It is clear that Exxaro would prefer being taken at face value, rather than providing comprehensive proof to clear up the matter. On the morning of 28 September 2012 earth moving machinery was once again active in the area, removing topsoil from Weltevreden pan. The DWA was alerted soon thereafter. At the time of publishing Exxaro has already cut deep into the border of the pan, removing ore from the coal bed below, removing much if not all of the approximately eight metre thick top coal zone at the perimeter of the pan. It is unclear if the bottom coal zone has been extracted yet. The Department of Water Affairs states that the investigation is currently in a sensitive stage, and requested those that enquired to wait for the outcome of the investigation. Interested and affected parties are concerned that Exxaro may leverage this delay caused by the DWA’s closed-door’ investigation as an opportunity to amend its water license without following due process, regardless of legislation that states that no mining activity may occur within one hundred metres of a natural water body. Exxaro is the largest black-empowered company listed on the JSE and is a giant in the international mining industry. It has a multitude of environmental achievements and the destruction of one small pan will have little effect on the food and water security of a country. But mining activities are growing and civil society has to react, especially in cases where mining companies go beyond what they are allowed to do. Exxaro already caused unlawful harm to a natural water body and if this is not properly dealt with, the door will be wide-open for much more and irreversible harm. Franz Fuls is a researcher collaborating with EJOLT partner Center for Civil Society.